As the CEO of Vermeer Corporation and the former chair of the National Association of Manufacturers, it is especially exciting to have Secretary Pritzker visit us here in Pella, Iowa today. When you look back at the origins of the Department of Commerce, you’ll see that the National Association of Manufacturers was at the center of support for its development. It’s fitting that the relationship between Commerce and the manufacturing community dates back before the Department’s official conception. The two share similar visions of progress - both strive to create jobs, promote economic growth and encourage sustainable development in communities big and small. This year, Vermeer Corporation celebrates 65 years of manufacturing high-quality equipment. What all started with one man – my father, Gary Vermeer – has evolved into a global industrial and agricultural equipment company helping make a real impact in a progressing world. Vermeer does more than manufacture yellow iron. Our equipment is used by customers to improve infrastructure that keeps people connected, work farms and ranches that support a vibrant food supply, and manage natural resources in an efficient and responsible way. Today, Secretary Pritzker will see examples of Vermeer’s global footprint by touring our manufacturing high-bay where Vermeer’s largest machine to date – the 200-ton T1655 Terrain Leveler surface excavation machine - is built and then exported around the world; the Vermeer Parts Center where more than 65,000 active parts are stocked and shipments are made domestically and internationally daily; and lastly, our lean brush chipper assembly line where the number of days from raw steel to finished product has been reduced from 52 days to 2 days as part of our lean journey that began in 1997. On behalf of Vermeer Corporation and the Iowa-based CEOs who will meet with her today in Pella, we welcome the opportunity to represent the voice of Midwest business as the Secretary acclimates herself to the opportunities and challenges industry faces to grow domestically and abroad. We thank the Secretary for making the commitment to listening to the leaders who are working everyday to grow American jobs and American business opportunities. Today, as part of her nationwide listening tour, Secretary Penny Pritzker toured Loud Recording Studios with Cary Sherman, Chairman and CEO of the Recording Industry Association of America (RIAA) and Jim Catino, Vice President of A&R for Sony Music Nashville. The music industry is a vibrant part of Nashville’s economy and the American economy as a whole. In fact, entertainment, literary and artistic originals contributed $74 billion to the U.S. economy last year, according to the Department of Commerce’s Bureau of Economic Analysis. According to a report by the Nashville Area Chamber of Commerce and the Music City Music Council, the music industry sustains more than 56,000 jobs and contributes both to the local economy and the region’s gross domestic product. During the roundtable, Secretary Pritzker not only discussed how the music and entertainment industries are contributing to the health of the creative economy, but also the key role the Commerce Department plays in supporting and protecting intellectual property and innovation. In Secretary Pritzker’s first five weeks as Secretary of Commerce, she has met with or spoken to more than 100 CEOs and entrepreneurs. Since assuming the office of secretary, she has prioritized meeting and speaking with representatives of the business community to hear directly from them about how she can serve as a bridge to the business community. 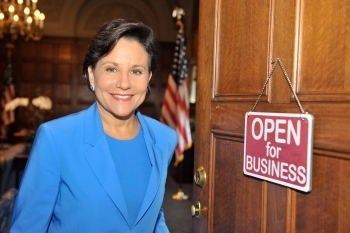 By calling top business leaders to discuss Commerce’s work in supporting American businesses and conducting small roundtable discussions, Secretary Pritzker is leveraging the opportunity to have an open dialogue and receive feedback from the business community about the commercial climates they encounter at home and abroad. Throughout these discussions, she has been hearing about the challenges companies face, the opportunities they see to increase U.S. competitiveness, and factors driving growth and investment in companies’ respective sectors. The feedback gained from these conversations is vital to growing the partnership between business and government. Secretary Pritzker is appreciative of the input she has received from over 100 CEOs of small-and medium-sized companies she has encountered during her roundtables and phone calls, and taken their feedback seriously. 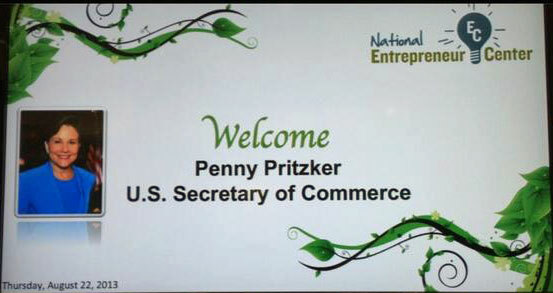 As she continues her nationwide listening tour, she is hopeful to continue to gain invaluable input from business leaders throughout the country that will help shape her agenda as Secretary of Commerce. 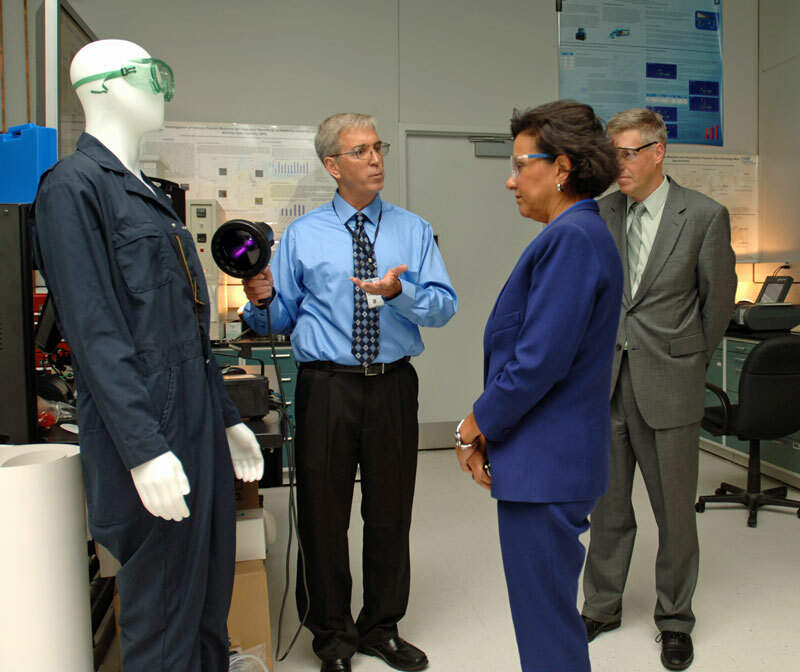 U.S. Commerce Secretary Penny Pritzker visited the National Institute of Standards and Technology (NIST) in Gaithersburg, Md., today, as part of her nationwide listening tour. The campus hosts approximately 2,700 NIST staff members, as well as visiting researchers, post-doctorate fellows and undergraduate students. The Secretary met with NIST senior executives to discuss Commerce priorities and took a tour of a laboratory focused on the most effective ways to collect and accurately analyze small or trace amounts of contraband such as drugs or explosives. The NIST Trace Contraband Detection Program supports the deployment and effective use of detection devices throughout the United States. NIST scientists use their existing expertise in particle analysis, analytical chemistry and chemical microscopy to study the explosives collection and detection process in detail and to help field methods. Secretary Pritzker saw demonstrations of some NIST-developed devices that could speed the processing of airline passengers while accurately assessing them for trace contraband. A shoe-sampler uses air jets to blow samples off of shoes still on the wearer’s feet, while another device checks IDs for samples transferred on fingertips. She also learned about the program making use of a 3-D printing machine to rapidly create new devices for improving detection methods. Through these efforts, NIST supports standards that ensure detectors in the field today work as expected and develops the specialized measurement expertise that will be needed for the next generation of explosive detection equipment. Yesterday, U.S. Secretary of Commerce Penny Pritzker traveled to Albany, N.Y. and Hartford, Conn. on the second leg of her nationwide listening tour. 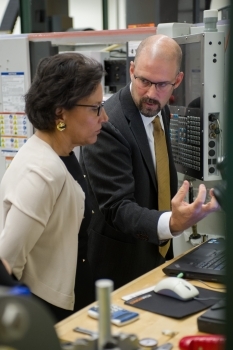 While in Albany, Secretary Pritzker met with senior leadership of SEMATECH and the New York College of Nanoscale Science and Engineering (CNSE). SEMATECH is a consortium of leading semiconductor device, equipment, and materials manufacturers and university partners from around the globe working on collaborative research on computer chip technology. CNSE is part of the State College of New York (SUNY) system and is home to the world’s most advanced education, research, and economic development enterprise targeting nanoelectronics and nanotechnology innovations. SEMATECH and CNSE are both models of how the public and private sectors can work together effectively, advancing innovation, industry collaboration and investment in the United States. 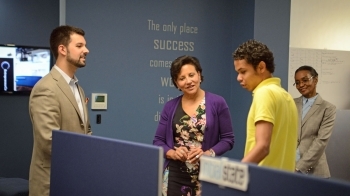 Secretary Pritzker also toured and heard from the Commerce Department employees at the National Oceanic Atmospheric Administration’s Weather Forecast Office. Today, U.S. Commerce Secretary Penny Pritzker visited APS Technology (APS) in Wallingford, Conn., as part of her nationwide listening tour. 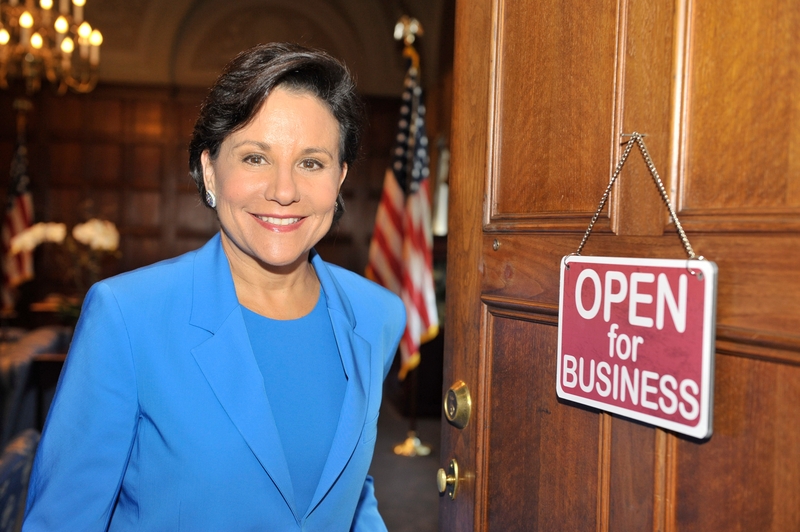 Secretary Pritzker is traveling across the country meeting with business leaders and entrepreneurs to discuss how the administration and the Department of Commerce can work with the private sector to help strengthen the economy and create jobs. 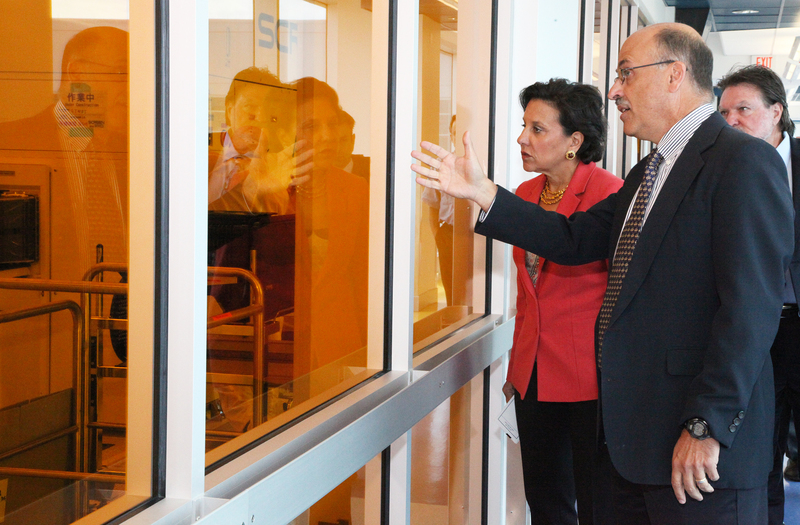 First, Secretary Pritzker toured APS’ facilities with company executives, including APS President Bill Turner and Senior Vice President Denis Biglin, along with Connecticut Governor Dannel Malloy. She was able to see some of the company’s projects, which include a variety of drilling tools that are used by the oil and gas industry. APS started in 1994 providing contract engineering services and has experienced tremendous growth to become a leading provider of products to the oil and gas drilling industry around the world. 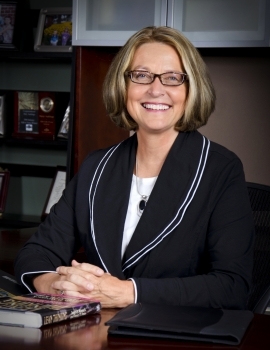 APS has grown from 79 employees in 2008 to more than 300 employees, including 265 in the U.S. The company’s exports now account for 85 percent of their business. As a part of her nationwide listening tour, Secretary Pritzker met with officials from SEMATECH and the State University of New York College of Nanoscale Science and Engineering (CNSE) while in Albany, New York today. SEMATECH and CSNE are leaders in semiconductor technology in the U.S. and among the most innovative enterprises in the world. 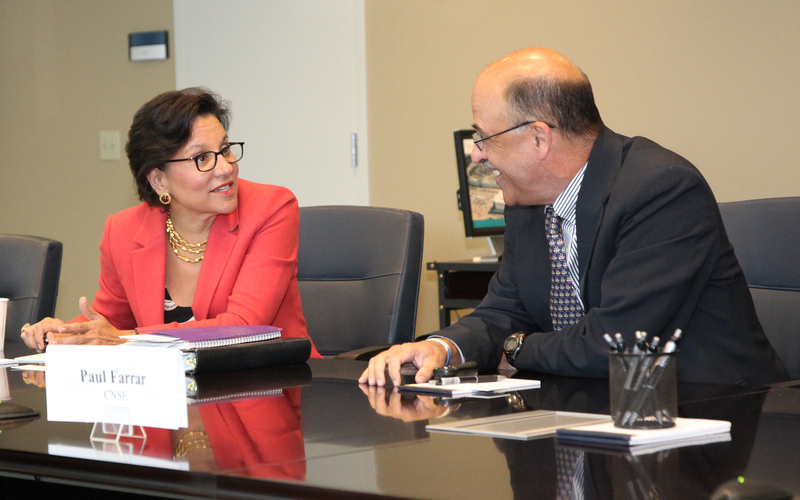 Secretary Pritzker met with the executives of SEMATECH and CNSE to discuss the global challenges that accompany a constantly evolving industry. The secretary also spoke about the role Commerce’s National Institute of Standards and Technology’s (NIST) plays in creating standards and funding research with SEMATECH and CNSE. She also asked about how the Commerce Department can support growth in the semiconductor and high-tech industries. During her visit, the secretary went on a facility tour of CNSE Nanotech and see state-of-the-art chip making technology firsthand. In the NanoFab North room the secretary saw SEMATECH employees conducting research and she stopped at the NanoFab Central Viewing Gallery where she saw rival companies collaborating in a clean room on nano electronics R&D. In the NanoFab Xtension room she viewed the new Global 450 Consortium clean room–a $4.8 billion partnership of Intel, IBM, Global Foundries, Samsung, TSMC, and CNSE to lead the industry’s transition to 450 mm wafers.